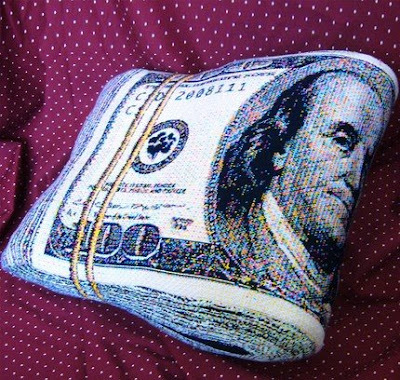 How About Keeping Your Money ON TOP of Your Mattress? Actually I think it's more "not" than "hot." I'm afraid I'll be spending my decorating budget elsewhere! I'm going to agree on the NOT. I can't even figure out who their target demographic is! PS there is also an HKD one. They also sell pillows shaped like beer cans, car wheels, and tree logs, as well as a few regular designs. I can't think of anything off the top of my head that would be less fitting in the home of someone who is truly frugal.